Arastan will be at the German Christmas Market in Delhi this weekend, showing off our Christmas decorations and much else. If you are in Delhi we hope to see you there, if not then why not join in the festive fun anyway with some Christmas decorations from the Arastan collection?! 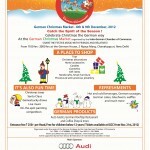 As well as lots of festive goodies,there will be German food products, home accessories, handicrafts, gift articles and much more: a Gingerbread House, German Rooftop Restaurant and Coffee Shop, German Beer, traditional German Christmas Cake, German sausages and potato salad, a beautifully decorated Christmas tree and of course, Santa Claus. There will also be a painting competition for children, magic show by a German magician, Lucky Draws, Live Music and Christmas Choirs and lot more. Come and attend this fun filled event with your family and friends!